Finally after long time my first finished GLBasic game is comming to Steam (currently only for Windows). Nothing special, more as a test that I can do it and finish work on that project, generally it's a bundle/pack of few logical/puzzle games. Little back story: some games started as Symbian OS projects years ago, coded with QML/JS and released on official Nokia/Ovi store, remade later in GLBasic and enchanced. Games are 'inspired' by already available titles, nothing original just done in the way that I like it. At first I was aiming to release all games seperately (with in-app advertising) yet during to long developement time and possible Steam release I choosed to bundle them. At beggining I wanted to use GLBasic as ultimate tool, yet as we know future Android/iOS platform status makes this hard/impossible, despite this I wanted to at least check other platforms, so I ported game to pure HTML5/JS with Canvas based drawing. HTML5/JS port is used on Android (with Cordova), Windows Store (desktop and phones), LG TV, Vewd and possible others. Steam version is made with GLBasic, it has gui with fancy transition animations and this will be main version to add possible enchantements, additional games or whatever. As You may surely assume, I don't have any special / big expectations for this release, just to pave the way, enter this market and see how all things like project management in store are done. Next in line are two GLBasic games, that are already waiting from some time, target platform is also Steam. #Invalid YouTube Link# For some reason YT video doesn't work.. hm..
ps2. Maybe it would be better to have some kind of 'Steam Thread' to post all GLB projects available there in that topic, for such small releases it would be better. My question is: How do you promote your Android/iOS (and also Win/Steam) games? itch.io is good site, but it's for people that already are interested in indie gaming, so it has limited user base? And from what I see most games on it are rather demos/alpha projects. Kickstarter (or other such sites), great for bigger teams, not single developer (or duo dev + artist) as it's highly advised (in my opinion) to have dedicated PR man to handle all those Goals/material gifts/social media/and so on stuff. Earlier Steam Greenlight was place that you could pick some interesting projects from tons on crap games, now only Steam Early Access remains, yet still you can search on it for something interesting. But most promotion goes for games from larger teams or those that are closest to finish as final product. And that's obvious. All above also in some way require that your game/idea is original or at least really good designed / polished. What ideas you have to promote small / simple games that aren't unique in most part? Any sites/FB groups dedicated for reviews of such games, or even sponsored promotion (if they have really active user base). This is open topic so every idea counts. My publishing experience is limited to Symbian OS (that dead os from Nokia), and on it even indie developer could get attention from users. Each app category (like games/puzzles) had several subgroups: top paid, top free, last updated and so on - and that wasn't limited to top5, but it was much longer. Also popular games could get spot on banner on main page, and some other like this. Few days ago I've uploaded my pack of logical games to Windows Store and will see how it will go there. This will be opportunity to check how active is that market, and other ways to get attention. I will delete this part after code will lost validity. Many years ago I've written an VB app to solve polynomials and draw graphs for them, key part of that project were routines for calculating simpler math stuff with keeping the proper order of performing mathematical operations. And that basically this code is, a simple math parser. Off Topic / Anyone tried Win32 Bridge - Desktop App Converter to UWP? I'm just curious if any of Windows10 users tried to use Desktop App Converter, app from Microsoft that can convert Win32 apps/games to Universal Windows Platform - so such converted app/game can run on both win10 - desktop & phone versions, and can be published on Windows Store. It looks that should work with GLB made games, as there is also project ANGLE that can be used to port OpenGL ES commands to DirectX.. I don't have any device with Win10 so can't test it how it really works, but I will try to do some test with older Angle branch - for win8.1, just after I will deal with some build issues - just to many Win SDK packages and different VisualStudio version installed.. Interesting thing, GetMouseCount() on my Win 8.1 laptop returns number 32, and I have only mouse connected, and one visible in sys device inspector (of course beside touchpad), no touch screen. Is that normal in systems newer from Win 7/Vista? (as in XP/7 GetMouseCount() returns proper value) I know that Win 8 has many touch features but I would rather expect that additional mouse devices would be visible in GLB only when touch screen (if available) would receive some actions. When using 'SystemPointer True', MouseAxis(2) -> mouse wheel info, isn't working, it's always = 0, beside that mouse functions are working ok. But if I use SystemPointer False, then strange thing starts: mouse device 0 (SetActiveMouse 0) is that 'normal' mouse connected to pc, but mouse 1 also looks like active mouse, its X & Y position coords differs from mouse 0 only a little bit, and when physical mouse buttons are pressed both in-GLB mouse 0 & mouse 1 receive those 'clicks'. Can someone check how it's looking on Win 10? Is this some kind of bug or rather new OS feature? It isn't big deal as for desktops there is no need to check additional mouse devices. This is my attempt to make code editor with features that standard IDE is missing. 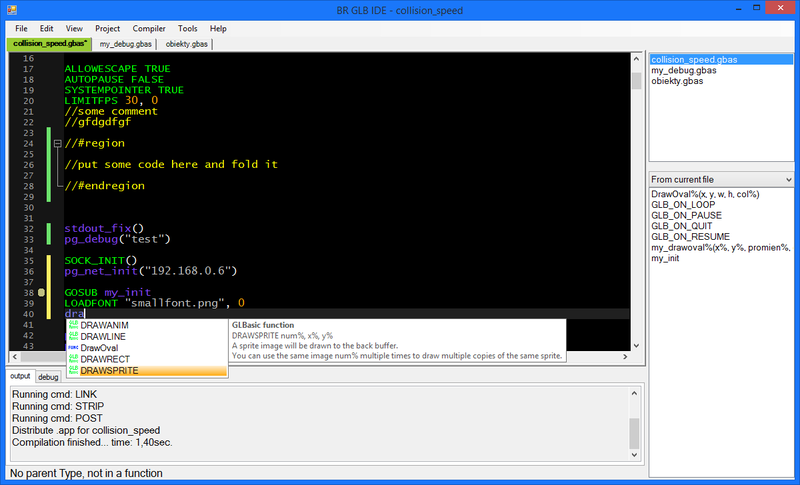 Written in Visual Basic 2013 with .NET 4.5 and ScintillaNet 3.x, a source code editor for GLBasic. Free, full source code included (WIP project so beware of coding style). NOTE: Not all functions have their own menus, try using same keyboard shortcuts as in standard editor. and use 'stdout_fix()' function at start of your sources, and STDOUT as equivalent of DEBUG. What you need to get it work? 1. Download and install .Net 4.5 Framework Redistributable / Client Pack, newer system have it built-in. 2. Compile any project with normal GLB IDE, and copy 'glblicence.inc' ('C:\Users\-X-\AppData\Local\Temp\glbasic' or '%temp%\glbasic') to app directory. This file is needed by glbasic compiler, but files from temp dir are always deleted, so we need to have it in some place and copy each time before compiling. 3. Run my IDE, goto 'tools->Options', type proper path to your GLBasic dir (to know where is the compiler, for example: 'C:\Program Files (x86)\GLBasic_v14'), also specify company name, save cfg. 4. Load your project, edit, select win32 platform, compile. All should work now. Legacy projects - no longer updated. To keep this post clean download links will be separated from main editor attachment. Simply it's PureBasic project with command line interface, that can open and compile GLB projects, you just need to pass any legit source code as argument, and app will handle the rest. Thats why it can be used with external code editors like SublimeText (as they can't read GLB project themselves). This problem applies to Android platform with latest 11.322 GLB version, on v10 (and Android) or Win32 (either v10 or v11) there is no such problem. In simple words, some polygons that are further are rendered over the closer ones, as if the depth function was set wrong or some z buffer parameter was incorrect. This applies to X_Drawobj and inline glDrawArrays, I tried to use glDepthFunc(GL_LESS) and with GL_LEQUAL parameter but that doesn't help, so problem is probably in some init functions. SETCURRENTDIR("Media") // seperate media and binaries? And if 'indices' will be DGIntArray - % type as above there is no need to convert indices to GLuint, it's working without it. I know it's Friday night, but the sooner the better. One form of making $$ from games is in-app advertising, but so far we had no luck with it. Although there were attempts to make iads working on ios, but from what I see, now it does not work. That's why it's time to move on. 1. gif loading - this format is used for animated banners by some ad networks..
Now, thanks to the gif loader (available here), we can use this format so the problem disappeared. 2. user-agent string - such as in a default browser on the phone .. now we have to manually type it into code, and as you know, it will not be 100% correct with what is shown by browser. 3. uuid / imei - I do not know how it currently looks like - whether the uuid collecting applications are rejected? because, some networks require to pass encoded (eg md5) uuid or MAC address - which you can not currently retrieve in GLBasic. After recently viewing different source codes (eg 'ad mediator' for corona sdk) I stated that if they can use in-app advertising, we also should do it! ;] I have rewritten my old unfinished custom parser for one of ad networks, improved many things and now alpha code is ready to testing. Unfortunately I do not have any other device than my pc so I ask you to help with testing. Currently there are parsers for 3 ad networks: InnerActive, InMobi and madvertise - on the pc when setting test APP_ID for them, all these networks response with test banners showing that implementation is correct. Another ad networks can be easily added - it would be good if such network would have a Client API - not only sdk. A lot of talk but how to test it? We need real device testing, on some ready games/apps - check if ad providers response with real ads, does parsers work properly on them, and most important, does clicks are counted. NOTE: 'madvertise' ad network need our IP address as parameter in POST body, so additional script is required to retrieve our ip, example code included in source. Also this provider doesn't like some 'user-agents' for example TouchPad isn't recognized = even test ads aren't served. We can load jpg, png and bmp files, but whole gifs world was beyond our reach, until now. But after long searches for most understandable code, I found some source in Java, and translation to GLB began.. Here it is, GIF loading code, with examples. NOTE: I only 'converted' that module to GLBasic, real thanks should go to Jitsu Wan for his Java source. // restrictions. I am NOT responsible IF something will not work properly. // heavily based on gif loader for Java ME by Jitsu Wan with reference to work done by Kevin Weiner, FM Software; LZW decoder adapted from John Cristy's ImageMagick. DEBUG "GIF load error: wrong file size\n"
// DEBUG "reading start: " + GETTIMERALL() + "\n"
// DEBUG "reading end: " + GETTIMERALL() + ", file size: " + gif_file_size% + "\n"
// DEBUG "it's a gif file..\n"
// DEBUG "loading end: " + GETTIMERALL() + "\n"
// DEBUG "array x-size: " + gif_currxlen% + ", loop count: " + gif_loopcount% + ", delay: " + gif_delay% + " \n"
// DEBUG "frame count: " + gif_framecount% + ", in-sprite pos: " + gif_curr_posx% + "x" + gif_curr_posy% + "\n"
// DEBUG "new image: " + gif_framecount% + "\n"
// DEBUG "extension: " + "\n"
// DEBUG "graphic ext: dispose: " + gif_dispose% + " \n"
// DEBUG "netscape ext \n"
//raise error - format error? // Decodes LZW image data into pixel array. // Adapted from John Cristy's ImageMagick. data_size% = gif_read() // Initialize GIF data stream decoder. // Decode GIF pixel stream. // Load bytes until there are enough bits for a code. // Read a new data block. // Get the next code. // Pop a pixel off the pixel stack. // DEBUG "new position in sprite: " + gif_curr_posx% + "x" + gif_curr_posy% + "\n"
//DEBUG "info: " + gif_width% + "x" + gif_height% + ", colors count: " + gif_gct_size% + "\n"
Edit: little update, fixed issue with not clearing image buffers..
More info and instructions, examples of code in glB are also included. It's win32 bin, but should work also on wine in Linux..